TIME PICKS ANGELA MERKEL AS PERSON OF THE YEAR, TRUMP: “THEY PICKED THE PERSON RUINING GERMANY”……. – The Tundra Tabloids……. TIME PICKS ANGELA MERKEL AS PERSON OF THE YEAR, TRUMP: “THEY PICKED THE PERSON RUINING GERMANY”……. This is why she does it, the accolades from the cultural elite. 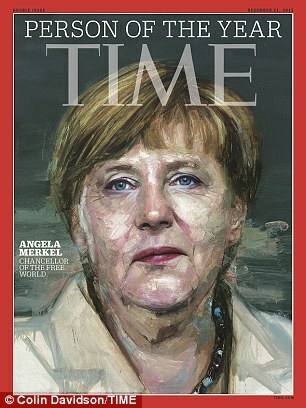 German leader Angela Merkel has been named Time Person of the Year, it has emerged. The 61-year-old topped a list of finalists that included US tycoon Donald Trump, the Black Lives Matter protest movement and Uber’s CEO Travis Kalanick. ISIS leader Abu Bakr al-Baghdadi, described by Time as a ‘brooding muezzin of death’, was second on the list. Merkel’s selection was announced this morning on NBC’s Today show. She was praised by the magazine for her leadership on everything from Syrian refugees to the Greek debt crisis. ‘Leaders are tested only when people don’t want to follow,’ Time editor Nancy Gibbs said in a statement issued Wednesday. In her commentary, Gibbs said the Chancellor was ‘not taking the easy road’. ‘Not once or twice but three times there has been reason to wonder this year whether Europe could continue to exist, not culturally or geographically but as a historic experiment in ambitious statecraft. ‘Merkel had already emerged as the indispensable player in managing Europe’s serial debt crises; she also led the West’s response to Vladimir Putin’s creeping theft of Ukraine. But now the prospect of Greek bankruptcy threatened the very existence of the euro zone. Previous Post Previous Post SWEDEN: ARTIST INSPIRED BY PAT CONDELL’S SHIP OF FOOLS VIDEO……..
Next Post Next Post NETHERLANDS: LESS THAN 50% OF REJECTED ASYLUM SEEKERS LEAVE THE COUNTRY……..